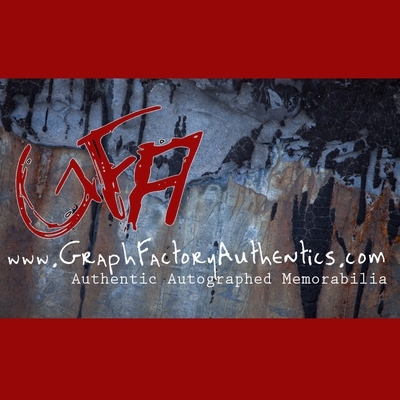 Graphfactory Authentics has gained over 15 years of experience in the autographing hobby. All of our autographs are obtained in person by a GFA representative, thus guaranteeing the 100% authenticity of each and every item. Additionally, all items are guaranteed to pass a 3rd party authentication process (psa/jsa). It is our top priority to make sure our customers are assured about the authenticity of our merchandise. COA: All items will come with a GFA COA (certificate of authenticity) and in certain instances (high valued merchandise) a tamperproof hologram will be placed on the COA and a matching hologram on the item being purchased. It is important to note that not all items come with holograms on them, but if desired GFA can add a hologram to any requested item. All items will be kept on record at GFA for any future questions.